alaTest ha raccolto ed analizzato 43 recensioni su Remington WDF4830C. La media della valutazione per questo prodotto è 3.9/5, confrontata con la media della valutazione di 4.3/5 per altri prodotti. Abbiamo analizzato differenti valutazioni di esperti ed utenti, età del prodotto ed altri elementi. A confronto con altri prodotti, Remington WDF4830C ha ottenuto un alaScore™ complessivo di 82/100 = qualità Molto buono. 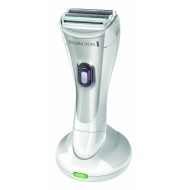 High quality ladies shaver at a very good price. very happy with this shaver, does what it says would buy again and good value for money..
i really like the shaver, it is soft on skin and doesnt hurt like other shavers ive had, but i dont think it is best ive had as have to keep going over and over to get all hairs, dont feel like its working as good as others ive used. Whatever you do, DO NOT buy this, it is totally rubbish, i wasted my money on this thinking it was a good deal but it's not.